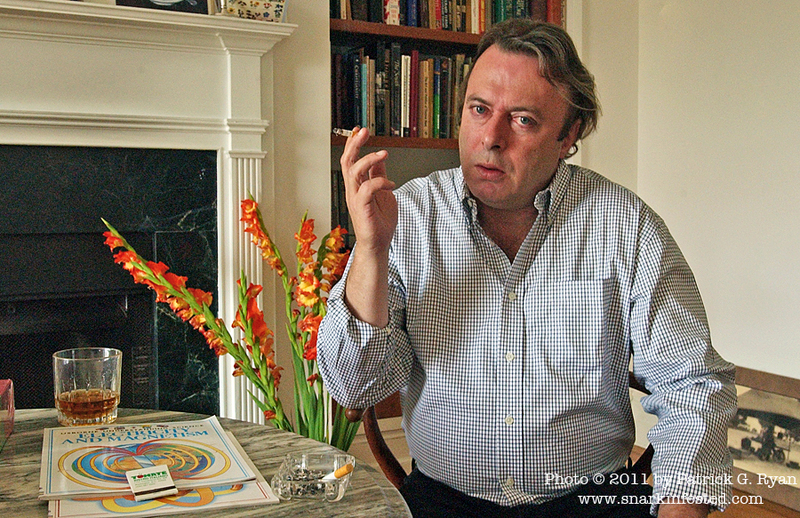 12/16/11 The great essayist and contrarian Christopher Hitchens died last night after a long battle with esophageal cancer. He was a literate and passionate writer whom I enjoyed reading because he was quick to drop his line of argument and go straight for the ad hominem attack. He made a career out of going for the personal attack, actually. I also think of him as being a good host. I made the above portrait of him in June 2004. He was being interviewed by a TV crew when I showed up at his huge apartment in The Wyoming that morning. I checked out his bookcases while he finished up. I remember PG Woodhouse and many books on photography and film criticism. He came over to greet me wearing socks and we immediately started talking as though we’d known each other for years. I’d taken his picture before. Back in 1999, I was photographing red carpet arrivals for the premiere of the anti-smoking movie The Insider. It was held at DC’s art-deco movie palace, The Uptown and a lot of big wigs had been invited. Everyone was waiting around for one of the movie’s stars, Al Pacino to show up when I saw Hitchens walk into the movie house with a cigarette in his mouth. A couple minutes later, he was roughly escorted out with a goon at each elbow. It was like watching a scene from a silent movie. I told him how funny I thought it had been for him to tweak the crowd by walking into the theater smoking. He laughed but said he’d no recollection of it. We sat down and had a whiskey. I took pictures as we chatted. His wife came in at one point and he introduced me. We talked about his forthcoming book on Jefferson and his tiff with Sidney Blumenthal and we talked about movies. We talked about a book called The Cruel Sea which I’d read because he mentioned it in one of his columns as being the best novel about the Battle of the North Atlantic. It’s 11 am and I can’t quite tell if he’s already blotto because he’s amazingly coherent on every topic we touch on. But then he lights a match and holds it in front of my face. There’s a longish pause. I don’t have a cigarette in my mouth to light. Makes me laugh. He offers me a smoke and I take it – you can see it in the ashtray above. “How did I know you smoked” he laughs. And then we drank some more. A poignant and fun piece! Thanks for offering this window into the world of Christopher Hitchens. I feel as if I were there.